Having trained at Exeter and Wimbledon Art Colleges between 1984 and 1990, fine artist Nicola Beattie specializes in contemporary sculpture using traditional materials of stone, bronze and alabaster. She also paints large contemporary art canvases to further express ideas along the theme on which she is working. The larger bronzes are usually made first in plaster before casting and Nicola also makes smaller pieces in stone and bronze for both indoors and outside. 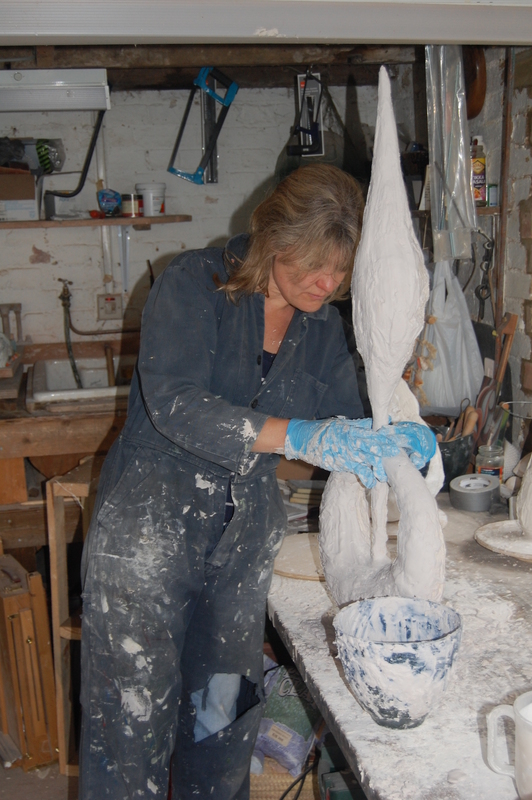 Her sculpture is full of rhythm and echoing curves – this rhythm and fluidity is essential to her work which has been exhibited both abroad and throughout the UK. London exhibitions and galleries include: The Royal Academy Summer Exhibition, The Mall Galleries, The Menier Gallery, Sotheby’s Art Gallery, and Cork Street Gallery Open competitions. Alongside exhibiting, Nicola has completed a number of contemporary art commissions for both private and corporate clients in the UK, her work is also held in collections in Germany, Turkey, Poland, Hungary, Greece, Singapore, the Caribbean and Australia.